QGraphicsView can be used to visualize a whole scene, or only parts of it. The visualized area is by default detected automatically when the view is displayed for the first time (by calling QGraphicsScene::itemsBoundingRect()). To set the visualized area rectangle yourself, you can call setSceneRect(). This will adjust the scroll bars' ranges appropriately. Note that although the scene supports a virtually unlimited size, the range of the scroll bars will never exceed the range of an integer (INT_MIN, INT_MAX). QGraphicsView supports affine transformations, using QTransform. You can either pass a matrix to setTransform(), or you can call one of the convenience functions rotate(), scale(), translate() or shear(). The most two common transformations are scaling, which is used to implement zooming, and rotation. QGraphicsView keeps the center of the view fixed during a transformation. Because of the scene alignment (setAligment()), translating the view will have no visual impact. QGraphicsView::DontClipPainter 0x1 This value is obsolete and has no effect. 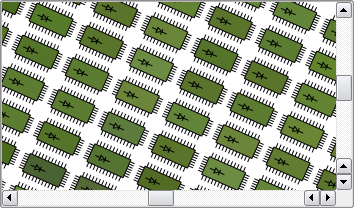 QGraphicsView::IndirectPainting 0x8 Since Qt 4.6, restore the old painting algorithm that calls QGraphicsView::drawItems() and QGraphicsScene::drawItems(). To be used only for compatibility with old code. This property holds whether the view allows scene interaction. flags that can be used to tune QGraphicsView's performance. how the view should position the scene when the view is resized. See also alignment and transformationAnchor. See also dragMode, items(), and rubberBandRect(). how the view should position the scene during transformations. how the viewport should update its contents. If rect is empty, or if the viewport is too small, this function will do nothing. See also setTransform(), ensureVisible(), and centerOn(). Returns true if the view is transformed (i.e., a non-identity transform has been assigned, or the scrollbars are adjusted). See also setTransform(), horizontalScrollBar(), and verticalScrollBar(). See also items() and Sorting. Returns a list of all the items in the associated scene, in descending stacking order (i.e., the first item in the returned list is the uppermost item). See also QGraphicsScene::items() and Sorting. Returns a list of all the items at the position pos in the view. The items are listed in descending stacking order (i.e., the first item in the list is the uppermost item, and the last item is the lowermost item). pos is in viewport coordinates. The items are sorted in descending stacking order (i.e., the first item in the returned list is the uppermost item). See also itemAt(), items(), mapToScene(), and Sorting. The items are sorted by descending stacking order (i.e., the first item in the returned list is the uppermost item). See also setMatrix(), transform(), rotate(), scale(), shear(), and translate(). See also setTransform(), transform(), scale(), shear(), and translate(). This signal is emitted when the rubber band rect is changed. The viewport Rect is specified by rubberBandRect. The drag start position and drag end position are provided in scene points with fromScenePoint and toScenePoint. When rubberband selection ends this signal will be emitted with null vales. This functions returns the current rubber band area (in viewport coordinates) if the user is currently doing an itemselection with rubber band. When the user is not using the rubber band this functions returns (a null) QRectF(). Notice that part of this QRect can be outise the visual viewport. It can e.g contain negative values. See also rubberBandSelectionMode and rubberBandChanged(). See also setTransform(), transform(), rotate(), shear(), and translate(). See also matrix(), setTransform(), rotate(), scale(), shear(), and translate(). The view does not take ownership of scene. See also setTransform(), transform(), rotate(), scale(), and translate(). See also setTransform(), transform(), rotate(), and shear(). Returns a matrix that maps scene coordinates to viewport coordinates.